How Do I Know I’m Getting Enough Protein? How do I know I’m getting enough protein? I hear this question often. There are many reasons why people wonder if they are getting enough. Selective eaters are a common concern for parents. Times of accelerated growth such as childhood, adolescence, pregnancy and lactation increase our requirements as well. Vegetarians choose not to eat meat based on moral values or texture and flavour preferences. As meat prices continue to increase, cost can also be a factor. I put together a video about protein, so take a peek and let me know what you think! Protein helps build and repair tissue and is important for growth, hormone and enzyme activity. Your hair and nails are made up mostly of protein. It helps you stay full and avoid sugar cravings, making it a great tool for weight loss. According to Eat Right Ontario, adults (19 years and over) need 0.8 grams for every kilogram of body weight. For example, if you weigh 68 kg (150 lbs), then you would need about 55 g of protein per day. This value however is based on a sedentary adult and may not reflect your stage or activity level. If you are very active, trying to lose weight, pregnant or lactating, you require more protein to meet your needs. It is best to speak with a health care professional for additional guidance. Where do I find protein? Let’s start at the beginning. Protein is made up of amino acids. It is easy to get sources of complete protein from the animal world. For those who don’t care for meat but like eggs, cheese and other forms of dairy, I encourage them to enjoy these sources in moderation. As a Nutritionist, I believe that we would do ourselves a whole lot of good if we started incorporating more plant based meals on a regular basis. Let’s be clear, I like meat however, I think vegetables often take the back seat while the steak gets all the fanfare. We politely take a serving of veggies to give the impression that we are doing a good job at this healthy eating thing. A neat thing happens though when we take meat off of the menu. We make more room for plant based foods and allow more room for exploration in our diets. The reality is that vegetables ARE delicious and they can be prepared in so many ways to suit anyone’s taste buds. We just need to experiment. Beans are often neglected unless we are making chili or bean salad. Did you know that you can use black beans to make a delicious savoury burger or even decadent brownies? 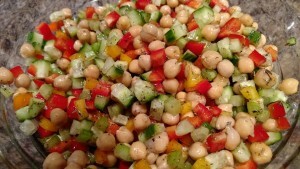 Chickpeas make a fantastic salad ingredient too! In the plant world, it can be more difficult to get all the essential amino acids in one food to make a complete protein source. There are a few complete plant protein sources though – chia, quinoa and hemp seeds are a few of my favourites. With other plant based proteins, food combining becomes an important piece of the puzzle. Ezekiel or Silver Hills bread is the perfect mix of sprouted grains that forms a complete source of protein. Eating beans with rice, peanut butter with whole grain bread or hummus with pita also forms a complete protein. Here are a few protein sources to consider adding to your diet. What about protein powders? I consider this a ‘sometimes’ choice. Many of the powders that are available are filled with artificial flavours & sweeteners. As in anything, you get what you pay for. Opt for a quality powder and use occasionally. Is it really a good idea to condition yourself to expect a chocolate shake every morning for breakfast? There are so many great options out there for real food protein sources, why would we settle for anything less? What are some of your favourite protein sources? Leave your comments & recipes below if you would care to share!